We offer comfortable and stylish self-catering holiday accommodation ideal for 2 people. We are happy to accept bookings for short breaks (minimum 3 nights) and are flexible about arrival and departure days. Sauchenford Cottage is a semi-detached self-catering holiday cottage which has been refurbished to a very high standard and comprises a double bedroom, lounge/dining room, fully equipped kitchen and bathroom. See the house page for full details and pictures. The holiday cottage is situated in the countryside just outside Stirling, in the heart of Scotland, and is a perfect touring base for north and central Scotland. It is surrounded by fields with cows, horses and the occasional brown hare or buzzard, and Finlay the Westie lives next door! 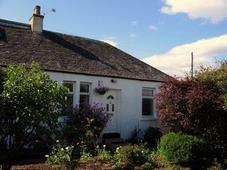 The central location means you will be within easy reach of cities, lochs and mountains. Edinburgh, Glasgow and Perth are all less than an hour's drive away. There is a country park nearby and Loch Lomond and the Trossachs are also within an hour's drive. If your interest is in the hills, the Ochils are right on your doorstep, just across the river Forth along the Hillfoots road. There is excellent access via the many glens along this road. If you are looking for a bigger challenge then the mountains of the Central Highlands are a short drive away. The village of Plean is close by for essential shopping but if you need more choice there is a major supermarket within 3 miles. Stirling has convenient town centre parking with easy access to a full range of stores as well as many interesting shops and eating places. Links Places of interest and facilities within easy reach.